full match report from tonight's game, with reaction to come later. Tomorrow attention turns to the League Cup, so join us again then. Cheerio. A concerned Villa fan: Villa to join Forest and Blackburn as a big club with lots of history in the Championship if this form continues, next 3 fixtures are Spurs, West Ham and Southampton, can see this run of 5 losses and no goals become 8 losses without a goal and ultimately relegation. Aston Villa fans waiting to hear the thoughts of Paul Lambert I'm sorry to disappoint you, there's been no sign of him as yet for his post-match interview. Tom Castle: Surely there is some fine print in Lambert's contract that will void it. Phone the lawyers. QPR manager Harry Redknapp on Sky Sports: "It was an excellent performance, we did ever so well. They dominated possession in the second half but once we put an extra man into midfield we started seeing more of the ball and hit the post before scoring a second. We have worked very hard here at home. "Sandro had his first 90 minutes tonight and he made such a difference. I've not had players like Jordon Mutch and Joey Barton available and I've just not been able to gel a team together. "I had a spell of putting Bobby Zamora on as a sub, but I had a chat with him and we decided to try him from the start and take him off when he tired. There's no reason why Charlie Austin can't score a lot of goals this season, I'm pleased for the lad." There will be no manager more relaxed than Harry Redknapp tonight, with his very future as QPR boss speculated to have been in doubt had they lost to Aston Villa. Still plenty to do, mind, as I felt QPR - Charlie Austin aside - were pretty average against what was a poor Villa side. Sid the Villain: The bottom 6 now will be the bottom 6 at the end. No improvement at Villa in 3 years with Lambert. Our luck will run out unless a change is made. Adrian: Supporting a team means supporting everything about it including the manager. Villa have Lambert get behind him and less of the negativity. Scott, Lincoln: Charlie Austin is a very underrated striker in this league. Him and Vargas could be a deadly pair as the season goes on. Football journalist Amy Lawrence on BBC Radio 5 live: "I just thought the sound of QPR fans oleing midway through the second half was a symbol of how desperate they were to see a positive sign here. "QPR were relatively comfortable and to have that almost relaxing game is really helpful and the psychological difference of not being bottom of the table will do them the power of good." 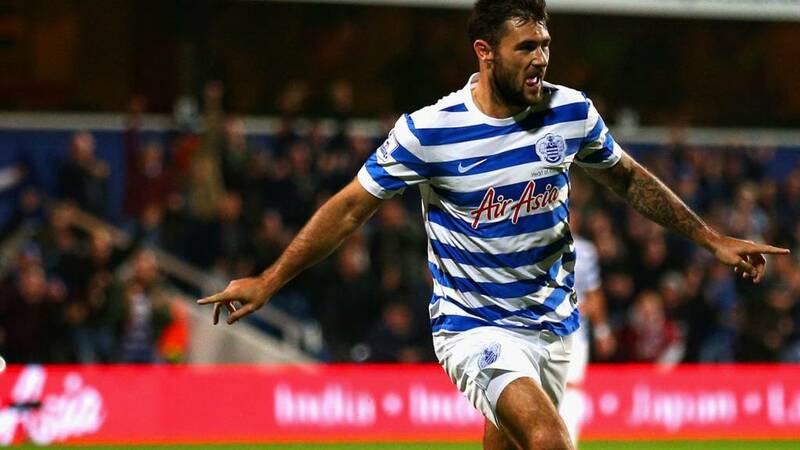 Midfielder Jermaine Jenas: "Great performance from QPR great to see Charlie Austin getting across the front post! Proper strikers finish that, also Vargas and dunny!" Austin Nkem: Everyone talking about Paul Lambert, but what's old Roy Keane's role in the team? Villa only gone backward since he's joined. So what's to be done, Aston Villa fans? Have your say right now on BBC Radio 5 live by calling 0500 909 693 or text on 85058. Bradley Wright-Philips scored his 27th goal in just 32 games for New York Red Bulls, equalling the all-time MLS goalscoring record in a single season. QPR striker Charlie Austin, speaking to Sky Sports: "Without my team-mates I wouldn't score goals. It's a massive win. We knew if we put in half the performance we did against Liverpool, we'd get something out of this game. But we put in an even better performance." QPR striker Bobby Zamora, speaking to Sky Sports: "It was a great finish for Charlie Austin's first goal. It gave us something to hang onto. "Our performances at home have been very good. It's a good turning point for us today." Jonathan Warren: I've supported Lambert but it is time for him to go. He has a much improved squad this year but we're awful for the third year. Tariq: Making the wrong records. Worst run in the club's history! Sad thing is I can't see him getting sacked. Jack Preece, Tamworth: Villa have Spurs and in-form West Ham next and I can't see any points out of those games. If we don't score that's 7 games, 0 points, 0 goals and hopefully the sack for Lambert. "Fully deserved. Not a lot of quality and not a lot of difference between the sides but the introduction of Junior Hoilett and Leroy Fer going into midfield just shored things up and they deserved the win in the end." QPR secure only their second win of the season to move off the bottom of the Premier League, Charlie Austin's goals enough to ensure they leapfrog the striker's former team Burnley. That's five defeats in a row for Aston Villa, who have also not scored a single goal in that run. QPR retain possession as time ticks away. Both sides just going through the motions now really, with the inevitable outcome seconds away. Femi John Atoyebi: Aston Villa have been sloppy, daft and clueless tonight. Relegation looks imminent. Liam Sharpe: Benteke is going to have one heck of a sore back at the end of this season if Villa are to stay up. Void of all creativeness. Harry Redknapp winding down the clock a little bit as he makes another change, Leroy Fer walks off to a standing ovation with Niko Kranjcar replacing him. Three minutes of stoppage time shown by the fourth official. QPR make a change as defender Armand Traore replaces Eduardo Vargas. Shoring things up. You feel that chance in the 80th minute was Aston Villa's best to set up a tense finish. The home fans certainly think so and there is a party atmosphere in the stands with QPR fans in full voice. Their side are set to climb off the bottom of the table with a win. Ryan Seaman: Not sure Harry Fisher (75 mins) has heard of Saido Berahino. Joshua Roberts: Harry Fisher is obviously forgetting about a certain Saido Berahino... No Englishman better at the moment. Brian, London: There's something about Redknapp, down but never out. Aston Villa are yet to score in the final 15 minutes of a Premier League game this season but they have their best chance yet when Tom Cleverley fires in a volley from the edge of the area that Rob Green parries, but it looks like Ciaran Clark is certain to bundle in only for Sandro to get across and do enough to put him off and Green is able to deny the follow up. Matthew Lowton fouls Junior Hoilett and picks up Aston Villa's second booking of the game. Frustration at their plight bubbling, perhaps? Villa are on course for their fifth defeat in a row. Confidence is oozing through the QPR players now as the Loftus Road crowd belt out 'Oles' every time one of their players completes a pass. They almost have another reason to cheer as Junior Hoilett clips the ball into the area to put Eduardo Vargas through on goal but he fires straight at Brad Guzan, who then smothers the ball with Charlie Austin lurking. "QPR, with the players they have, should be competitive at this level. This is a good win, they should have beaten Liverpool and they will not be cut off at the bottom." Aston Villa boss Paul Lambert responds to that goal by making a double change. Andreas Weimann and Ashley Westwood go off, with Darren Bent and Joe Cole on in their place. Can they make a difference? "Junior Hoilett has come on and offered natural width and almost immediately QPR hit the post, and then the first time they get inside and put in a good centre, they score a second and put daylight between themselves and Aston Villa." A huge goal for QPR as Charlie Austin grabs his second of the game. Carlos Sanchez gives the ball away and Eduardo Vargas embarks on a lung-busting run towards the Villa area, clips the ball across goal and Austin stabs in. Harry Redknapp is up off his seat and puffs out his cheeks in relief. Junior Hoilett's pace is always a danger and he finds himself with the ball and in space on the left, he breaks towards goal before curling a shot that has Brad Guzan beaten, but hits the post. Coming up after this game on BBC Radio 5 live, your calls, texts and social media reaction following QPR v Aston Villa on 5 live Football Social. Bobby Zamora's work is done for the evening as the striker, who set up Charlie Austin's goal, is replaced by Junior Hoilett. He slots into midfield, with Austin the lone striker. I was a little surprised to see Andreas Weimann return for the second half after taking a knock in the first 45 minutes, but he is too slow to a challenge and catches Yun Suk-young, earning himself a yellow card. "With all due respect, Ciaran Clark is the last player you'd want to be on the end of that - especially because it was on his wrong foot. It was a good opportunity for Villa though." Much better from Aston Villa as Ashley Westwood lifts a free-kick into the area for Christian Benteke, who heads the ball down for Ciaran Clark just a few yards from goal, but the ball bounces awkwardly for the defender and he hooks his shot wide of the post. If Gabby Agbonlahor had got on the end of that, it might have had had a different outcome. Gabby Agbonlahor charges forward before slipping a pass to Tom Cleverley, who in turn tries to send Aly Cissokho away down the left. Cissokho is well marked, though, and he can only skew his cross out of play and into the stands. Dan, Herts: Lambert has to go, he lacks any personality when I front of the camera's and this can only transfer to the players in the dressing room and on the pitch. Peter Richardson: Lambert sack? Ridiculous. Building team, spot on against Liverpool but bad run of form including big teams = sack? Unfair. Adam: As a United fan, and a David Moyes sympathist, I think both clubs this evening would have a marked improvement with Moyes. Phil, Lincoln: Watching this Aston Villa team is painful. 8 hours without a goal and don't even look like scoring against the bottom side in the league. No urgency, no movement, wayward passing, terrible final ball. Lambert just doesn't seem to have real tactics or ideas. Chris: Hardly classic Monday night football. Casually following the live text hoping the match ignites but I more likely to win last week's lottery I think. If you joined us just for this game, then you may have missed the FA Cup first-round draw earlier this evening. on our FA Cup index, as well as all the reaction. Worth a check to see which non-league teams could have a good chance of edging closer to a glamour tie against a Premier League team. Joel McCroy Oblates: I actually thought its going to be a dull game tonight, i am enjoying every minute of it. If I had spent the first half just watching our stats page, and believe me that would probably have been as exciting as watching this game, I'd have thought we'd had quite the end-to-end encounter on our hands. There have been 12 shots in total, with five on target. Charlie Austin had the only one that counts though. "Everybody is struggling for time on the ball because they are playing through the congested final third. It's a fractious game. "This isn't good enough from Aston Villa, I don't know why Paul Lambert isn't changing things. They have got good players but there's no width. It's so predictable it beggars belief. If they want to carry on like this, they won't score goals and they won't win games of football." QPR have their noses in front at the break, with Charlie Austin scoring from the home side's first shot of the game. Aston Villa, meanwhile, have offered little in response. Big improvement needed in the second half. Dazza, Birmingham: It is time for Lambert to go if we lose tonight.. Same old no tactical brain. Clueless. Charlie, Birmingham: Why has Lambert suddenly got so little support? Considering Villa have had a run of last season's top four followed by Everton, our points tally is good, a win takes us back into the top half. Fickle fans. I'm pretty sure I can hear individual chats at Loftus Road now, with the atmosphere having gone as half-time approaches. Ashley Westwood sends the ball into the QPR area but Sandro hacks clear. Villa are eight hours without a Premier League goal, and it is clear to see why. "It's been an edgy game, reflecting the position of both clubs. The highlight has been Charlie Austin's goal." Andreas Weimann hobbles off to the edge of the pitch after getting caught by Leroy Fer's block. He is able to return after a minute or two but is moving a little gingerly. A concern for Villa fans, with Weimann, who has grabbed two winners this season, having looked one of the more lively players on the pitch in this half. A swift attack by Aston Villa ended with Andreas Weimann whipping a cross into the area. A hearts in mouths moment as Richard Dunne storms in at the near post but the ball, probably to the relief of QPR fans, flies past the defender and into Rob Green's hands. "It's awful, there is no fluency or pattern to the game. There are a lot of balls being given away needlessly because there is no option on for the man with the ball." Darren, Birmingham: With David Moyes still available Villa need to make the decision to sack Lambert who is so inept of any tactical knowledge. Rob, Sunbury: Great credit to Harry for being so bold with selection & formation. Austin beginning to find his feet in the Prem? Yun Suk-young whistles a free-kick into the danger zone but Villa keeper Brad Guzan is off his line to punch clear. The ball goes straight back to QPR though, as Sandro heads the ball for Bobby Zamora to try and get on the end of, but Ron Vlaar does superbly to keep the QPR striker at bay and the ball trickles out for a goal kick. Dan, London: Superb passing on display. QPR giving it straight to Villa, Villa giving it straight back. Measured. "You can question the shape and balance of both of these teams. There just isn't enough width in this game. It's scrappy and a lot of the play is happening in congested central areas." It has all gone a bit scrappy now after an initial good response from Aston Villa, who have had real trouble sticking the ball in the net this season, their struggles in the final third perhaps summed up as Aly Cissokho over hits a pass for Christian Benteke, who was in a bit of space in the QPR area. Tim Oliver: How many games with Aston Villa have to lose until Roy Keane gets blamed because he shaved off his beard? He's already started on the next one, Tim. A good response from Aston Villa as Christian Benteke directs a header just wide, with Rob Green diving at full stretch. QPR have conceded at least two goals in each of their last five Premier League games, so no time to settle just yet. "That was a rather splendid strike by Charlie Austin." Anon: Must win for Villa today. In my opinion got to win these games to make life easy on yourself. Time breeds stability in football wasn't always sold on Lambert but I'm still hopeful. Please let us know your name and where you are on texts. "It's a wonderful finish. A long ball from the back and Bobby Zamora, who bullied the Liverpool defenders last weekend, held off Ron Vlaar and laid it off for Charlie Austin. It's against the run of play, but QPR deserve it for being positive and playing two up front." Route one-tastic. QPR take the lead as a long ball from defence is knocked down superbly by Bobby Zamora on the edge of the area to the feet of Charlie Austin, who lashes home. Perfect start for the hosts. Carlos Sanchez smacks a volley from Mauricio Isla's clearance towards goal and, while it is well hit, it is straight at QPR keeper Rob Green. Best chance so far though. "Aston Villa have pace and if they do manage to get Gabriel Agbonlahor one-on-one with a defender, they will cause QPR some problems. The home side look a little nervous at the moment. Some people say it can be better to play away from home in these situations, when you don't have the pressure of expectation." Gabby Agbonlohar weaves into the area and shapes to shoot but Richard Dunne sticks out a big boot to block the shot. The QPR defender will also have been delighted to see the ball from that challenge fly out of touch on the right after scoring an own goal against Liverpool last time out, which saw him become the first player in Premier League history to reach a tally of 10 own goals. John Pierce: This could easily be a Championship game next season. Very few good players on show. QPR do seem a little rattled by Aston Villa's ability to hit them on the counter and they have dropped the tempo a little bit, allowing the away side to dictate play with Carlos Sanchez seeing plenty of the ball in midfield. No real chances for either side yet, though. BBC Radio Leeds' Adam Pope: "Leeds United Academy manager Neil Redfearn is understood to have verbally agreed a long term deal with owner Massimo Cellino to become the club's new head coach. No contract has been signed yet." Paul Barnfield, Hull: Both QPR and Aston Villa have lined up with what looks like 4-3-3 formations. Both sides desperate for a win so expect this to be an exiting, attacking game! "Three times now Aston Villa have caught QPR on the counter. They're showing why they are a dangerous team away from home. I like the look of Carlos Sanchez in the Villa midfield - he's busy, good on the ball and breaks things up." First sniff of a chance for Aston Villa as a weak QPR clearance goes only as far as Ashley Westwood, but he lashes his shot straight at Robert Green in the QPR goal. Villa's attack came from a quick counter after the home side lost possession. Something for the hosts to watch out for? "It's a good start from QPR - they're putting lots of pressure on the ball and getting players forward on the overlap, especially down the right side. It's very positive." QPR are straight on the front foot and win an early corner, but it comes to nothing. Aston Villa assistant coach Roy Keane responds to the home side's bright start by throwing some chewing gum down on the floor in front of him. Would anyone dare to tell him to pick it up? "I'm pleased to see two players up front for QPR. It will get the crowd going because they need to get after Aston Villa. Charlie Austin will relish having Bobby Zamora alongside him." Despite the two clubs' poor form, there is a good atmosphere under the lights at Loftus Road. Can one of them pick up a much-needed win tonight? QPR, who start with Bobby Zamora and Charlie Austin in attack, get us under way. QPR midfielder Joey Barton: Big game tonight. Gutted to miss it but injury is almost there. Wishing the lads all the best. Need our 12th man. "QPR have got to get a win sooner or later. The way the last game ended against Liverpool was farcical. Aston Villa are not comfortable in the league either, so it's going to be a bit of a scrap." Listen to BBC Radio 5 live commentary from Loftus Road on this page. "This season already has a worryingly familiar feel for QPR to their doomed campaign two years ago when they picked up just four points from their first 12 games under Mark Hughes and Harry Redknapp wasn't able to save the sinking ship. "This time they've got four points from eight games but after the match against Aston Villa it's Chelsea away and then Manchester City at home which surely puts a little added pressure on getting all three points in this one. "Six weeks ago Villa were second in the table after their first four games having racked up three wins and a draw. They're now in the bottom half of the table having failed to add to their points tally, or even goals tally, in defeats against Arsenal, Chelsea, Manchester City and Everton." So then QPR fans, Harry Redknapp has developed a reputation of being a specialist in guiding sides away from relegation but do you think he is the right man to lead your side up the table and away from danger? Aston Villa fans, what about Paul Lambert? He had your side riding high early in the season but four successive defeats have seen Villa drop into the bottom half. Concerned? QPR boss Harry Redknapp, speaking to Sky Sports: "It is the same shape as the Liverpool game. The lads have done very well, it is always difficult leaving Rio Ferdinand out of the team, but he is a fantastic professional, he accepts it, I have just decided to give the other two lads in defence ago. "I want to see the same work rate again, same intensity. We are at home, there is a good atmosphere and we just need to make sure we give it a real go. "There is nothing in the table but we have to get that win first and if we do the table will look much better." QPR: Green, Isla, Dunne, Caulker, Yun, Vargas, Henry, Sandro, Fer, Zamora, Austin. Subs: Traore, Hill, Phillips, Kranjcar, Murphy, Hoilett, Ferdinand. Aston Villa: Guzan, Lowton, Vlaar, Clark, Cissokho, Cleverley, Westwood, Sanchez, Agbonlahor, Benteke, Weimann. Subs: Okore, Bacuna, Cole, Richardson, Bent, N'Zogbia, Given. QPR boss Harry Redknapp makes two changes - goalkeeper Rob Green back in the team to replace his understudy Alex McCarthy while Nedum Onuoha is replaced by Eduardo Vargas, the Chilean who scored twice in the 3-2 defeat by Liverpool last weekend. Rio Ferdinand is benched. Aston Villa manager Paul Lambert has made four changes to the team which were beaten 3-0 at Everton last time out, with Matt Lowton, Ciaran Clark, Andreas Weimann and Carlos Sanchez replacing Alan Hutton, Kieran Richardson, Charles N'Zogbia and Nathan Baker. Right then, it is time to switch my FA Cup hat for my Premier League one because there is some top-flight action tonight as QPR host Aston Villa. More has been said in recent days about about the spat between Harry Redknapp and Adel Taarabt than the club's current plight, with QPR propping up the standings after collecting just four points from eight games, but Redknapp's says the public dispute is now in the past. Taarabt will not feature tonight because of illness, and Redknapp could certainly do without the added distraction anyway. He needs to start picking up points and quickly, otherwise his 'Harry Houdini' getup might have to be pulled out of the wardrobe sooner than he'd have probably liked. if recent speculation is to be believed, perhaps even his job. wmorrell: East Thurrock at home. Why do I feel nervous???? Ships: Blyth Spartans v Altrincham must be one of the ties of the round with their combined FA Cup pedigree. David Edwards: Shrews at Walsall for 2nd year running in 1st round, time for some revenge!! Other tasty looking ties I would say are Canvey or Havant and Waterlooville v Preston or Chorley or FC Halifax v Bradford. Blyth Spartans versus Altrincham also sees a couple of non-league sides with FA Cup pedigree go head to head. Jonny, Bradford: Tasty little West Yorkshire derby if Halifax can beat Chorley. Been ages since we faced non-league, come on Bantams! Warrington Town manager Shaun Reid, speaking on BBC Two about his side's home draw against Exeter: "The chairman promised us a few quid if we got league opposition so the lads will be made up with that. "I played in the FA Cup against Exeter for Rochdale so it will be good to get them to our place." Plenty of the non-league sides will fancy their chances of getting through to the second round. Warrington at home to Exeter City, they might fancy an upset there? Matt Burgiss: Bristol City in the FA Cup first round, that will be a tasty game! Gonna be a gd night at Priestfield! Simon Tidmarsh: Glad to see the FA Cup on BBC and happy with Worcester City at home as a Coventry fan. Russell J Hume: So - The Shots are to make the trip down the M3 to take on Pompey in the First Round. Hmmm. Could be lively on & off the pitch. So there we have it, the first round draw is complete and we will know the full line-up once 12 fourth-round qualifying replays are played this week. First round ties will take place across the weekend of 7-10 November, with one match to be shown live on BBC Two on Friday, 7 November. Who do you want in the draw? Michael Henson: As a Bury fan, would like Warrington Town or AFC Fylde but will probably end up with Plymouth or Exeter away! Seventh-tier side East Thurrock United claimed a thumping 7-1 victory against Bath City in the fourth qualifying round to secure their place in tonight's draw. They are ball number 63. Manchester City Ladies player and England captain Steph Houghton: "I wasn't even born, but being a Sunderland fan... their victory in 1972 has been passed down to me. "I also personally remember Steven Gerrard's winner for Liverpool against West Ham very well." Everyone loves a bit of FA Cup giant-killing, don't they? Blyth Spartans are no strangers to toppling league sides in the competition, having embarked on a famous run to the fifth round in 1977-78, still the best run by a non-league side in the competition in the post-war era, beating Stoke City in the fourth round before losing to Wrexham. Could they repeat such exploits again? They are ball number 58. "The first time I won it was in 1996 against Liverpool. Eric Cantona scored the winner in the last minute. "I remember going up to lift the trophy and I was 10th in line, it seemed to take an age to get to me. David Beckham eventually passed it to me and then it was almost immediately snatched from me by the man behind me - my big brother, Gary." Jun Ho: I am a Cambridge United fan, and would not mind a rematch against our FA Trophy finalist again. #8 vs #67!! Lets go Amber Army!! Plenty of excited and nervous faces at St George's Park as Mark Chapman chats to former Manchester United defender Phil Neville and Steph Houghton - captain of the England women's team. OK people, coverage is live now on BBC Two, BBC Radio 5 and at the top of this page. Tune in, enjoy the build-up and follow the draw itself in around 10 minutes. Can you play in goal, mate? There will be some added spice when Alfreton Town play their FA Cup fourth-qualifying round replay against Lincoln City tomorrow - the former will have to play an outfield player in goal. only fit goalkeeper James Severn, pictured, ruptured a thigh muscle in the game and is out for eight weeks. Only players who are registered in time for the initial game are eligible to play in the tie. Stuie Neale: Swindon fan, home tie v Bristol Rovers or Oxford for a derby! Chris Ferguson: A home/away game at Sheffield United for @Blyth_Spartans please! An intriguing contest could await a Football League club, should one be handed an away trip to Maidstone United in tonight's draw. "We took a big gamble putting the 3G pitch down so if we can get a nice draw on Monday, that will bring some more publicity to our surface," Maidstone manager Jay Saunders told the FA. "I'd love for a Football League club to come down here so that everybody can see how good it is. This should help put the club back on the map." Maidstone are ball number 66. The FA: Don't forget! The FA Cup First Round Proper draw takes place St George's Park on BBC Two in less than 10 minutes. Shaun Reid: I'm thinking with me being on first name terms with the FA, maybe a nice draw tonight fingers crossed. By far the best club cup competition in the world. Gosport Borough have reached the first-round proper for the first time in their history, and there has been plenty of buzz in and around the Hampshire town ahead of tonight's draw. Here players from Gosport Borough Youth Football Club mark out the club's ball number - 67. DSM: The Magic of the FA Cup, Halifax Town to get to the quarters!! The lowest ranked team definitely through to the first round is Warrington Town, managed by Shaun Reid, younger brother of Everton 1984 FA Cup winner Peter. Shaun is at the National Football Centre at St George's Park along with Yellows chairman Toby Macormac to see if the Northern Premier League Division One North side can hit the jackpot. While Warrington fans are hoping for a home tie against Preston or Tranmere, Reid wouldn't mind a reunion with his former club Rochdale. It was for Rochdale against Bury that Shaun faced Peter faced in 1994. "We were knocking seven bells out of one another right from the off," recalled 49-year-old Shaun. Read more about Warrington Town and Shaun Reid on the BBC Sport website. Norton, who are ball number 52 along with Shildon: "FA Cup Draw." Russell Griffin: here's to a good draw for @tamworthfc Walsall please! Craig Cullen: let's hope the draw is kind to #GosportBoroFC. No 67 away to Pompey would be amazing!!! George Hawkes: Maidstone United #66. Any League team at home will do nicely. Let's show off our 3G pitch. The lowest-ranked team left in the competition is Shildon. The Northern League Division One side play in the ninth tier of English football, but are yet to confirm their place in the first round after drawing their fourth qualifying round game with Norton United 1-1. Their replay is on Wednesday. The two other ninth-tier teams left by the fourth qualifying round stage lost - Greenwich Borough were beaten by Worcester City while Willand Rovers' run was brought to an end by Gosport Borough. Shildon or Norton are ball number 52. This may be the draw for the first-round proper, but 600 teams have already played in and exited the FA Cup since this season's competition started in August. Teams to have been beaten include Lancaster City, who had ex-England winger Trevor Sinclair, 41, playing for them in the competition, and Maidenhead, with DJ Campbell - just a few months ago playing in the Championship - unable to help them progress. A team called FC Romania also exited in the qualifying rounds along with Sutton United, who famously beat Coventry in the FA Cup in 1989. "Great to see FA Cup back on BBC 7pm BBC 2 for the draw and BBC 5 live! Give Wrexham AFC a good draw Phil Neville please." We don't have too long until the draw gets under way, so a quick shout out for who you want your side to face? From Bradford City to Blyth Spartans, we want the thoughts of fans from all the clubs involved in tonight's draw. Who do you want and why? "I have never known excitement like this before. This is fantastic for a first round draw. "People are eagerly awaiting to see who gets who and Phil Neville is more nervous for this than he was for playing for Manchester United." The National Football Centre at St George's Park in Burton is playing host to the FA Cup first-round draw, which is taking place in front of a live audience of 300. Tasked with plunging their hands into the bowls of balls are three-time FA Cup winner Phil Neville and Derbyshire FA's Coach of the Year Tammy Snape. Draw coverage begins on BBC Two and BBC 5 live from 19:00 GMT, and you can watch it unfold online from the same time at the top of this very page. Hello! Welcome to our live updates of the first round draw for the FA Cup. The Premier League big guns may not enter the competition until January, but for League One and Two clubs this is when it all begins. For 44 non-league sides also in tonight's draw, though, their FA Cup journey has already begun having battled through the qualifying rounds, which started way back in August, joining the Football League sides in the hat for the first round draw. ...the FA Cup, the oldest domestic cup competition in the world, has played host to more than 100 years of memorable moments - upsets, great goals and thrilling encounters. For 48 Football League clubs, the hopes and dreams of creating such moments begins today, with the FA Cup first-round draw.